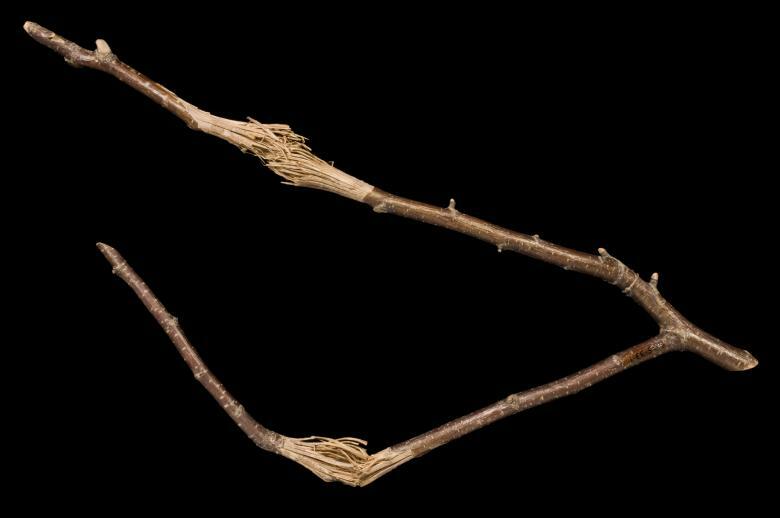 1893.61.1 'V' shaped divining rod for finding water, made from hazel twig. 1915.33.1 Donated by Rev C. V. Goddard, said to be broken in the twisting motion of water divining. Wiltshire. In the Pitt Rivers Museum there are a two water divining rods, donated by the anthropologist Edward Burnett Tylor in 1893. 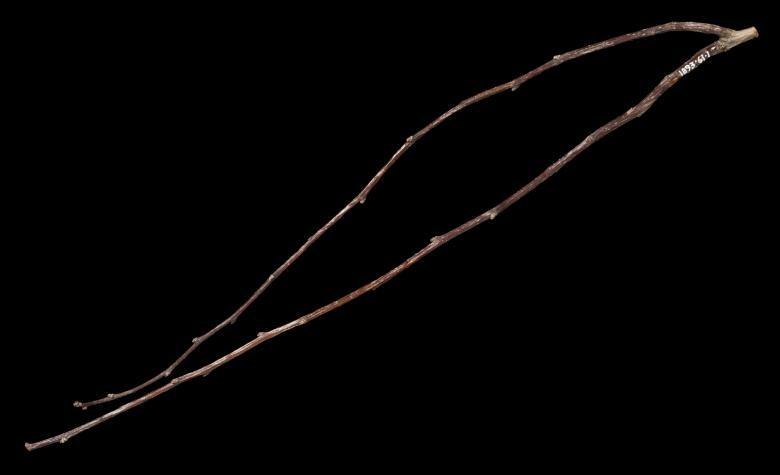 Each is cut at the junction of two twigs forming a V shape. They are stated to have been made by a professional water-finder in about 1880 near Wells in Somerset. In an article on Malay Divining Rods published in 1902, Tylor records what he states was his only experience "of the methods of the English water-finder." He states that it was some 20 years ago at Somerleaze, the home of Professor E.A. Freeman the Historian. He says that they invited a well-known and successful dowser in the Mendip district to come and demonstrate how he used his forked hazel divining rod. He was, Tylor states "a straightforward man, thoroughly believing in his craft and undeniably a successful well-sinker." In his trials the diviner emphasised the difference between surface springs and "main springs" which would give a permanent supply of water. Tylor says that it was not a serious trial and that it would not have been difficult to find suitable places near Wells in any case. They then asked the diviner if he could find treasure. Tylor's watch, a large old-fashioned gold repeater was hidden in the house under rugs, and he states that the rod sipped not far from where the watch lay. The diviner said that when he had found it, he had felt by the rod that he was over "a good main-spring." This article extract is from England: The Other Within - Analysing the English Collections at the Pitt Rivers Museum project website.